200 years ago The Last War divided the people of Melchior on their old world. Their dying planet was decimated by a final devastating standoff between the Ethereal and Obsidian Sects. In their desperation to live on, splinter groups of these two sects decided to aid each other in their last days and created a spaceship, an ark, to save the remainder of their people. They named it Zion, in hope for a future planet where they could begin anew. And so this small group of creators and their families launched into space and into the unknown as they watched the place they called home fall apart before their eyes. Manna: A young Ethereal with the thirst for knowledge and understanding. 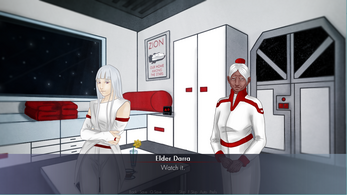 She recently began to work in the research field to satiate her curiosity but not even science could prevent her meeting Aster, who captivates her attention from the onset. 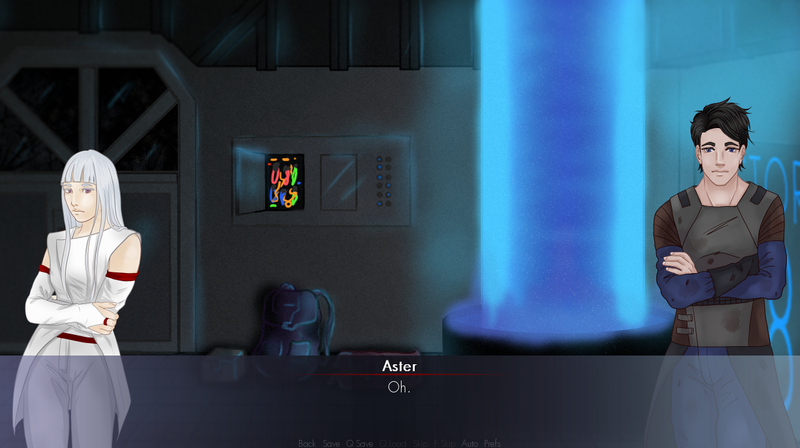 Aster: An Obsidian mechanic who does the repair work for the zone below Manna's cabin area. 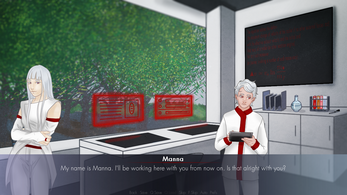 He has an immediate interest in Manna and the knowledge she has about the Ethereals. Elder Darra: One of the three wise Councillors of the Ethereal people. She has raised Manna as her own since she was young and has passed down her knowledge of their Melchior history and customs. Ever: The reserved young Ethereal prodigy works in the same department as Manna. He is remarkably intelligent and strives to discover all he can about the universe around Zion as they journey across the stars. Akiva: The Obsidian is head mechanic and mentor to Aster, Ezri and other young and impressionable Obsidian workers. Ezri: A friend of Aster's who has a tendency to get the two of them into lot of trouble. Captain Colm: The current Captain of the spaceship Zion. Note: This game has discussions about sensitive topics. Play at your own discretion. my friend & me: reading the game. Friend: brings up the MC's age . Friend's math was on point. Allow me to show you the math; Elder=112 years older than MC. Somehow, the Friendship and Forgiven ending feels more natural to the plot and the message at the epilogue (and maybe affected by my favoritism to those endings xD ). Thanks for playing! Glad you like those endings. They were interesting to write and even helped me understand the characters better myself. As for the romance, I guess I didn't portray it very well since it's so vague (and romance is hard to do write in a month haha), (SPOILERS here anybody else reading this) but Aster's feelings weren't actually a thing until the end. He was new to the whole mislead-through-romance-thing in general which made him act awkwardly and ironically worked in his favour. But hey, now that I think about it Aster's perspective might be interesting to delve into. Perhaps I'll go back and revise it one day. ... After I I finish my current project though, lol. what kinds of sensitive topics? It's nothing graphic at all. More of a precaution than anything. The characters just talk about the issues, I can't really say what without spoiling the plot. it's a really beautiful game,, from the art to the plot and everything in between.